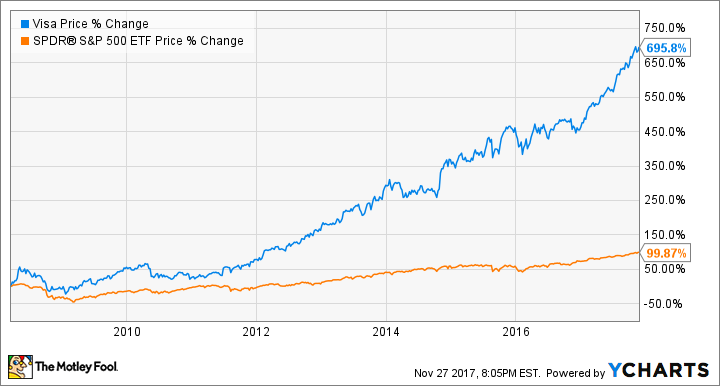 Visa's stock price has skyrocketed since the company went public almost a decade ago, but that doesn't mean it can't go higher. Here are three reasons shares are still a buy. In March 2008, Visa Inc. (NYSE:V) held its initial public offering, when shares of the company were traded on public stock exchanges for the first time. Even though that was the same month financial stocks were being absolutely battered on Wall Street, Visa's stock price quickly took off. Since going public, Visa's stock has returned a remarkable 695.8% for shareholders, almost seven times the return of the S&P 500 during that time span. It has yet to slow down; this year, Visa is up 43.5%. With the stock's remarkable appreciation and its hefty price-to-earnings ratio of almost 40, it's natural to wonder if the stock has reached its upmost limit and is finally due for a correction. I don't believe that to be the case, however, and at the recent UBS Global Technology Conference, Visa CFO Vasant Prabhu gave a presentation highlighting three macro trends that he believes will prove hugely beneficial to Visa's business model in the years ahead. Is Prabhu right? Will the three large movements -- the accelerating growth of e-commerce, digitization of transactions, and the lowering cost of card acceptance for vendors -- all significantly contribute to the growth in the company's top and bottom lines? Let's take a closer look at all three to determine how Visa will profit from these trends. Several macro trends will provide a tailwind to Visa's sails. Image source: Getty Images. People are not thinking about opening bricks-and-mortar stores if they don't need to, right? So anybody who has a concept of being a merchant and selling your goods and services, initially, almost anywhere in the world today, thinks about doing it in the digital world rather than in the physical world. So there again, so you immediately start with the growth of retail, if you want to call it that. It's clearly biased toward e-commerce to begin with. So that's a phenomenon by itself. The statistics back up Prabhu's observation. According to the U.S. Census Bureau, total e-commerce sales estimates in the third quarter of 2017 were $115.3 billion, good for 9.1% of total retail sales in the quarter. Online transactions increased 15.5% year over year, while total retail transactions grew only 4.3%. In other words, e-commerce is growing much faster than brick-and-mortar sales. Why is the growth so important to Visa? Because, according to Prabhu, for online purchases, "the propensity to use a Visa card is twice as high as a face-to-face transaction." If that amazing trend holds, Visa will stand to gain enormously as e-commerce continues to outgrow traditional retail. The second trend Prabhu discussed was the digitization of transactions that were much harder to digitize in the past. One example Prabhu gave was paying for parking: "You would never imagine paying for parking with cards even five years ago, right? You always carried quarters to pay for parking." There are other micro transactions we can probably all think of: From in-game video game purchases to ordering a pizza or cup of coffee through an app, technology has ushered in more digital transactions, often at the expense of cash. As digital transactions gain more market share, Visa's prominence only rises. The final trend Prabhu highlighted in his presentation was the lowered cost of acceptance for merchants to now accept debit and credit cards at the point of sale. He stated that where retailers used to need expensive equipment and landline access, that is no longer the case. In fact, all vendors need now is a QR code printed on the counter, and an app for the seller and the customer, and they can be accepting card payments in a matter of minutes. Prabhu emphasized that while this might not be a huge deal for sellers in the United States, it can be a game changer for merchants in emerging economies. For instance, he pointed out that India has seen more acceptance point growth in the past year than it did the previous five years combined. When a company's stock price keeps moving up, like Visa's, it can make it hard to pull the trigger and buy the stock. This is true whether you were considering buying the stock five months ago or five years ago -- either way, the price was much lower. For instance, if you were thinking about buying Visa a year ago, as I was when it was going for about $80, it makes it doubly hard to buy it when it's going for its current price of about $110. This is a form of price anchoring, and it can really hurt your portfolio's returns. Yes, Visa has skyrocketed since going public almost a decade ago, but that doesn't mean its growing days are over. What matters is where a stock price is going, not where it's been. In fact, given the macro trends highlighted here, I believe Visa shareholders will be celebrating market-beating returns for years to come.